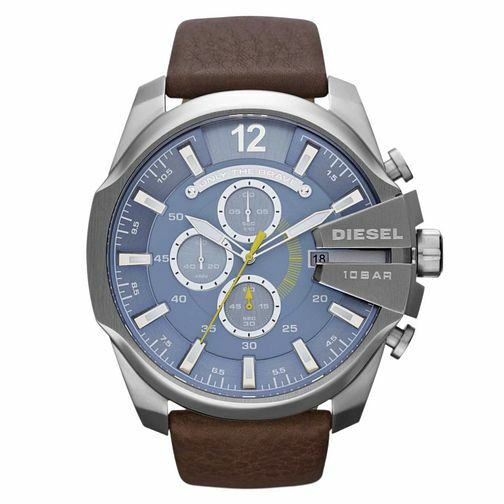 Diesel combine contemporary style with an edge of retro for this men's Mega Chief fashion watch. A brown leather strap secures a stainless steel case, set with a round blue dial featuring chronograph, date function, and accents of yellow detailing. Ideal, everyday style for him. Diesel Mega Chief Men's Brown Leather Strap Watch is rated 5.0 out of 5 by 1. Rated 5 out of 5 by Anonymous from Beautiful design Got the watch few days ago, I’m very happy with it! The genuine leather strap is quality and comfortable. I like that the watch is big and bulky because other waches disappear on my big hand. Hopefully it will be durable as well.